Reading and share top 17 famous quotes and sayings about Desire To Succeed by famous authors and people. Browse top 17 famous quotes and sayings about Desire To Succeed by most favorite authors. 1. 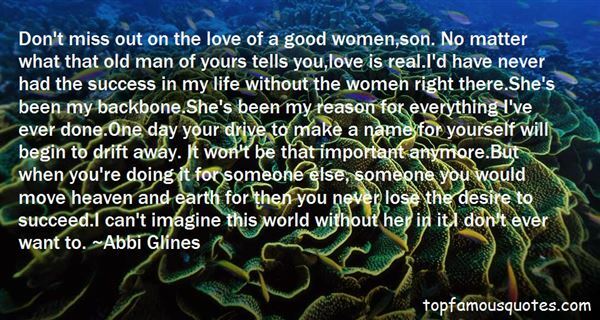 "Don't miss out on the love of a good women,son. No matter what that old man of yours tells you,love is real.I'd have never had the success in my life without the women right there.She's been my backbone.She's been my reason for everything I've ever done.One day your drive to make a name for yourself will begin to drift away. It won't be that important anymore.But when you're doing it for someone else, someone you would move heaven and earth for then you never lose the desire to succeed.I can't imagine this world without her in it.I don't ever want to." 2. "I believe at least in one of the chief tenets of the Christian faith--contentment with a lowly place. I am a doctor and I know that ambition--the desire to succeed--to have power--leads to most ills of the human soul. If the desire is realized it leads to arrogance, violence and final satiety; and if it is denied--ah! if it is denied--let all the asylums for the insane rise up and give their testimony! The are filled with human beings who were unable to face being mediocre, insignificant, ineffective and who therefore created for themselves ways of escape from reality so to be shut off from life itself forever." 3. "This praise, though far from fulsome, gave me pleasure and that is to my shame. But there was something in him, some power of spirit, that made me want to please him. Perhaps, it occurs to me now, it was no more than the intensity of his wish. Men are distinguished by the power of their wanting. What this one wanted became his province and his meal, he governed it and fed on it from the first moment of desire. Besides, with the perversity of our nature, being tested had made me more desire to succeed, though knowing the enterprise to be sinful." 4. "Think only of what you desire, and expect only what you desire, even when the very contrary seems to be coming into your life. Make it a point to have definite results in mind at all times. Permit no thinking to be aimless. Every aimless thought is time and energy wasted, while every thought that is inspired with a definite aim will help to realize that aim, and if all your thoughts are inspired with a definite aim, the whole power of your mind will be for you and will work with you in realizing what you have in view. That you should succeed is therefore assured, because there is enough power in your mind to realize your ambitions, provided all of that power is used in working for your ambitions." 5. "The will to win, the desire to succeed, the urge to reach your full potential... these are the keys that will unlock the door to personal excellence." 6. "For twenty-one years, I have been paralyzed by the fear of what this society will do with me if they ever were to know of the thoughts that I continually push away. For more than two decades, I have made a choice to be straight. After all, it's as easy as making a choice, isn't it? This culture has made sure that I know that. Anyone who is anything other than straight was just someone deceived by the devil. He is unnatural. He is confused. He is mistaken. He is weak. He can control it if he desires to control it. Such a compelling and ongoing argument has been made that I have always trusted it.I believed that if I hid it long enough, and ran from it long enough, and refused to acknowledge it for long enough, I could indeed succeed at living up to their decrees. I believed that I could force myself to never be anything else." 7. "To desire to write poems that endure-we undertake such a goal certain of two things: that in all likelihood we will fail, and if we succeed we will never know it"
8. "I still have the desire to succeed, and I've always felt success is measured by what you've done in the win column, not top 10s." 9. 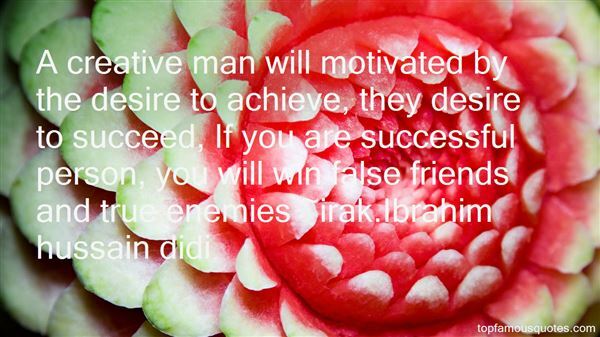 "A creative man will motivated by the desire to achieve, they desire to succeed, If you are successful person, you will win false friends and true enemies"
10. "Your desire to succeed must overpower your fear of failure!" 11. "In times of uncertainty there is a special breed of warrior ready to answer our Nation's call; a common man with uncommon desire to succeed. Forged by adversity, he stands alongside America's finest special operations forces to serve his country and the American people, and to protect their way of life. I am that man." 12. "A person's success is often limited by the level of their desire to succeed"
13. "I stand ready to lead us down a different path where we're lifted up by our desire to succeed, not dragged down by a resentment of success." 14. "We typically misunderstand what's wrong about consumerism. It's not that it makes us love material things too much. To be a good consumer, you have to desire to get lots of things, but you must not love any of them too much once you have them. Consumerism needs children who do not stay attached to their toys for very long and learn to expect the next round of presents as soon as possible. When consumerism succeeds, our attachments are shallow, easily broken, so we can move on to the next thing we're supposed to get. Being a good consumer means desiring new things, not cherishing old ones. And the new things you're supposed to desire are not always material things. Spirituality is now a consumerist enterprise, too." 15. "For some people, their fear to lose is greater than their desire to succeed, so they end up doing nothing and their dreams become impossible." 16. "Yes, now my mind is easy, I know the game is won, I lost them all till now, but it's the last that counts. A very fine achievement I must say, or rather would, if I did not fear to contradict myself. Fear to contradict myself! If this continues it is myself I shall lose and the thousand ways that lead there. And I shall resemble the wretches famed in fable, crushed beneath the weight of their wish come true. And I even feel a strange desire come over me, the desire to know what I am doing, and why. So I near the goal I set myself in my young days and which prevented me from living. And on the threshold of being no more I succeed in being another. Very pretty." 17. "I could not have desired her enough. She was a living soul and could be loved forever. Like every living creature, she carried in her the presence of eternity. That was why, as she grew older, I saw in her always the child she had been, and why, looking at her when she was a child, I felt the influence of the woman she would be. That is why, in marrying one another, we mortals say "till death." We must take love to the limit of time, because time cannot limit it. A life cannot limit it. Maybe to have it in your hear all your life in this world, even while it fails here, is to succeed. Maybe that is enough"
All the stories I have told you are finally as useless as all ancient knowledge is to man and to us. Its images and its poetry can be beautiful; it can make us shiver with therecognition of things we have always suspected or felt. It can draw us back to times when the earth was new to man, and wondrous. But always we come back to the way the earth is now."